We couldn’t be more pleased that for the third year running, Workday has been positioned as a leader in Gartner’s Magic Quadrant for Cloud Human Capital Management Suites for Midmarket and Large Enterprises. We achieved the highest overall position for our ability to execute, which we believe reflects our ongoing commitment to customer success, meaningful innovation, and quality experiences. Yet we recognize that different-sized organizations are, well, different. We’re proud to partner with our customers to achieve their vision, whether it’s a worldwide HR transformation or moving off manual systems to gain operational efficiency and prepare for growth. Meeting those different needs is why we have a range of deployment options available from our partners and Workday, all of them focused on ensuring customers move rapidly to getting value out of Workday. Our customers tell me that one of the biggest advantages of moving to Workday is the depth of reporting and insights that’s unlocked when all of their people data is in one place. We’ve firmly believed in the value of one source for data as part of what we call the Power of One since Workday’s inception. These capabilities give organizations more insights to make the right decisions, to stay ahead of the pace of business and head in the right direction. To truly understand where you stand against similar organizations, Workday Benchmarking allows customers to opt-in to contribute data about their workforces and, in return, see how you compare against industry peers, including metrics such as attrition, diversity, and leadership effectiveness. Another offering for our customers, Workday Prism Analytics, lets you combine data from Workday HCM with other sources, opening new ways to correlate people data with operational data. For example, a retailer could combine data from a point-of-sale system with Workday HCM to see where hiring needs for the upcoming holiday season might be greatest, and make the decision to provide a rotational assignment for a high-potential manager. Our customers have long been able to integrate Workday HCM with other applications, and our business process framework and configuration flexibility let customers address their specific needs. Yet, you’ve told us you want to do more, which is why we’re opening up the Workday Cloud Platform. Customers, partners, and others will be able to build applications and extensions on top of Workday, while still leveraging the Power of One and the deep investments that Workday makes in our core platform. We’ve already seen exciting examples of how customers will take advantage of this extensibility, in areas such as employee benefits, supplier onboarding, and achievements. We know you’re just scratching the surface of what’s possible with the power of the Workday Cloud Platform. You’ve also told us that you’d like to use Workday in different ways and alongside other business-critical applications. Our recently-announced partnership with Slack puts the power of Workday directly into Slack. Users will be able to see information stored in Workday, such as information about co-workers and organizational hierarchies, as well as enter time off, check vacation balances, and perform other transactions. We’re constantly innovating to improve our technology foundation and add new features and applications that drive our customers forward. As we look to the future, we’re excited about our customers’ ability to unlock even more insights about their people. With our recent acquisitions focused on talent optimization, business planning, and augmented analytics, we look forward to bringing even more innovation to our customers. Ongoing investments in our core technology platform will allow Workday HCM customers to take advantage of advances in machine learning through knowledge, vision, and language services that detect patterns in data, extract textual information from visual data, and enable natural language interactions. Today those services include personalized learning recommendations in Workday Learning, recommendations about employees who are retention risks, and better, more relevant candidates in Workday Recruiting. In the future, machine learning will add more intelligence across the entire employee lifecycle, from workforce planning to compensation and recognition to payroll. And coupled with the natural language processing abilities of the Workday Assistant, it’ll be even easier to interact with Workday HCM, including through applications that integrate with Workday. By delivering a rich experience where Workday HCM can suggest actions and leverage the power of people data, customers will be even more productive. And, with our recent acquisitions focused on talent optimization, business planning, and augmented analytics, we look forward to bringing even more innovation to our customers. To the more than 2,200 organizations worldwide that have chosen Workday Human Capital Management, thank you for the trust you’ve placed in us. Your success will always be a core value at Workday. We look forward to continuing the journey together. 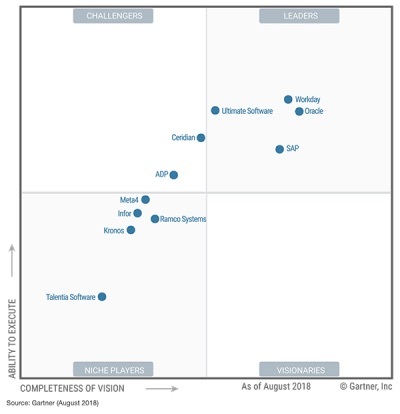 “Gartner Magic Quadrant for Cloud HCM Suites for Midmarket and Large Enterprises,” Analyst(s): Melanie Lougee | Ranadip Chandra | Ron Hanscome | Helen Poitevin | Chris Pang | Jeff Freyermuth | Sam Grinter | John Kostoulas | Jason A. Cerrato, August 15, 2018.